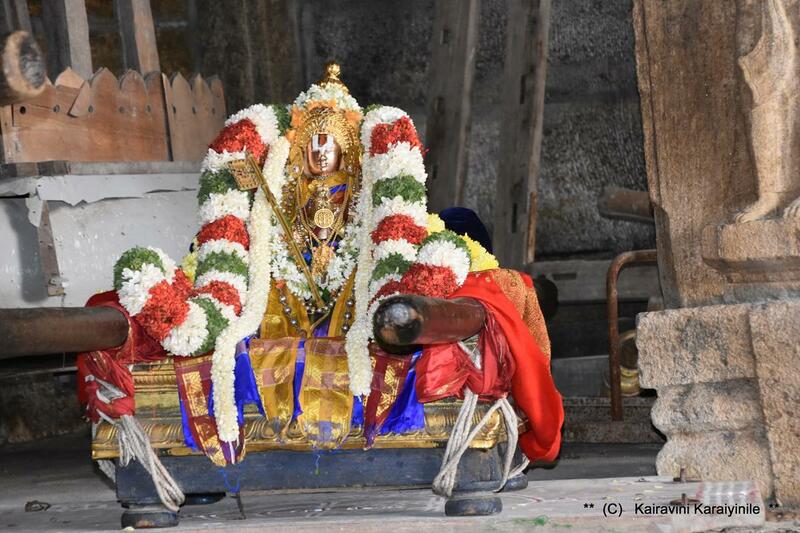 8th Aug 2018 was ‘Aadi Thiruvathirai’ ~ the thirunakshathiram of our Swami Ramanujar – here is something on our Acarya as worshipped at Melukote and some photos of that beautiful thirumeni of Swami Ramanujar at Thirunarayanapuram. 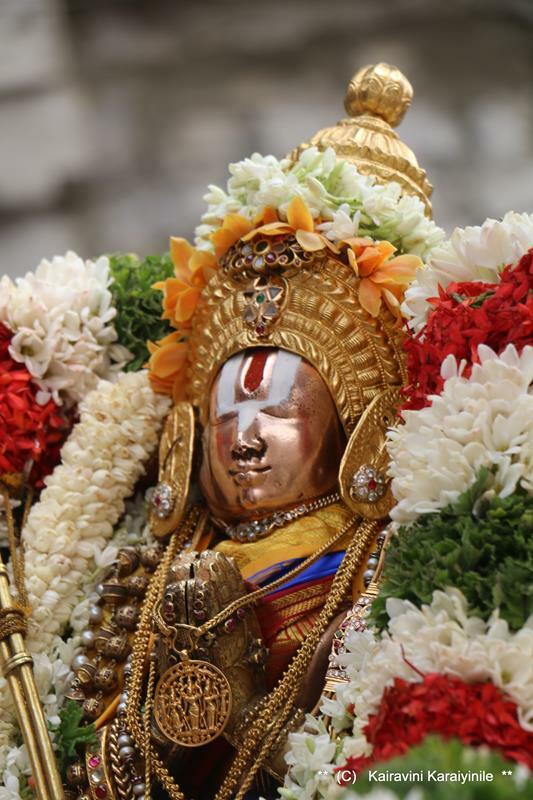 In those golden days when Swami Emperumanar walked on the streets of Thiruvarangam and other Divyadesams – tens of thousands of his disciples and hundreds of Jeeyars followed him hailing “Ramanujo Vijayathe – Yathiraja Rajaha” In the words of Thiruvarangathu Amuthanar, the earthly human beings were all given the true Knowledge by the birth of Acharyar Ramanujar and started disciples of Sriman Narayanan. Acarya’s movement away from Srirangam includes travel to kachmeeram, his commentary on Bodayana vrtti. Then there was a sad event .. .. .. I have posted on Sri Udayavar Vellai sarruppadi uthsavam and Sri Koorathazhwan wearing kashayam, going to raja sabha of Chola King and undergoing innumerable difficulties including losing his eyesight. 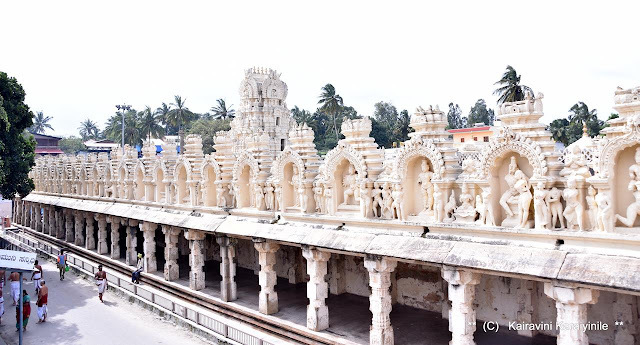 Our Acaryar ‘Yathirajar’ traversed long way and reached Saligrama, then to Thondanoor where he ordained King Bittideva into Srivainava path ~ he inspired the locals to building an earthern dam ‘Thonnur aeri’ also known as ‘Moti talab’ – on which banks now we see a 32 ft Ramanujar installed by Sri Yadugiri Yathiraja Jeeyar (more on this in a different post). 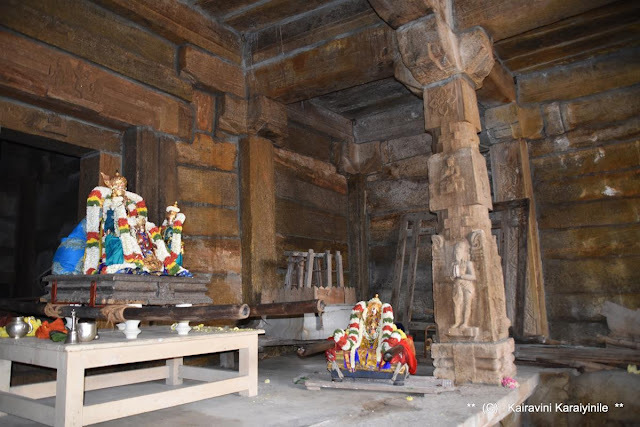 Acarya came to Melukote @ Thirunarayanapuram – climbed the hill of Yadusaila, discovered the idol of Thirunarayana in an anthill in Thulasi garden adjoining the champaka forest. 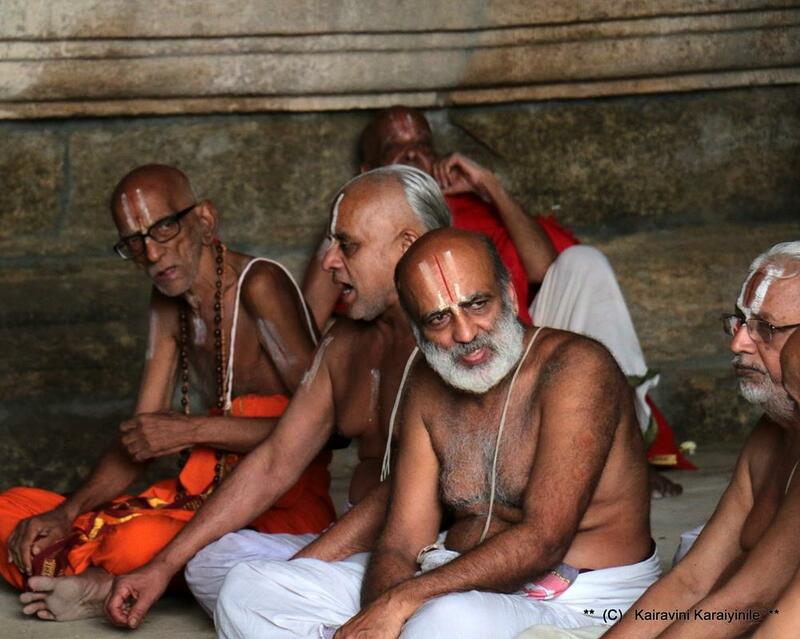 He also found natural source of thiruman, which we happily wear on our forehead. By some accounts, the renovation of the famous Cheluvanarayana Temple took place in punarvasu 1099. 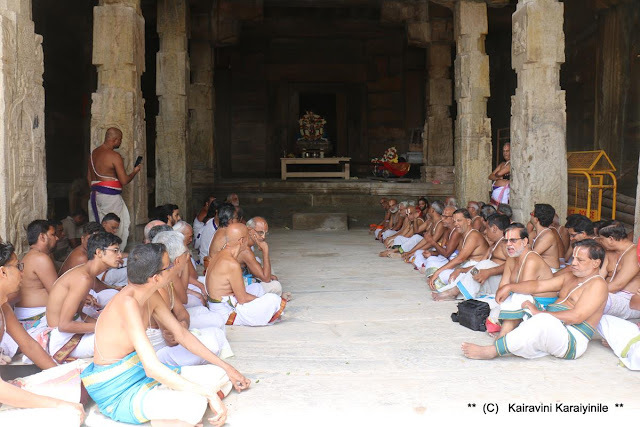 Sri Ramanujacharya himself conducted the worship for the first 3 days and then ordained Srirangaraja battar to follow the pancaratra method as prounded by Isvara samhita. 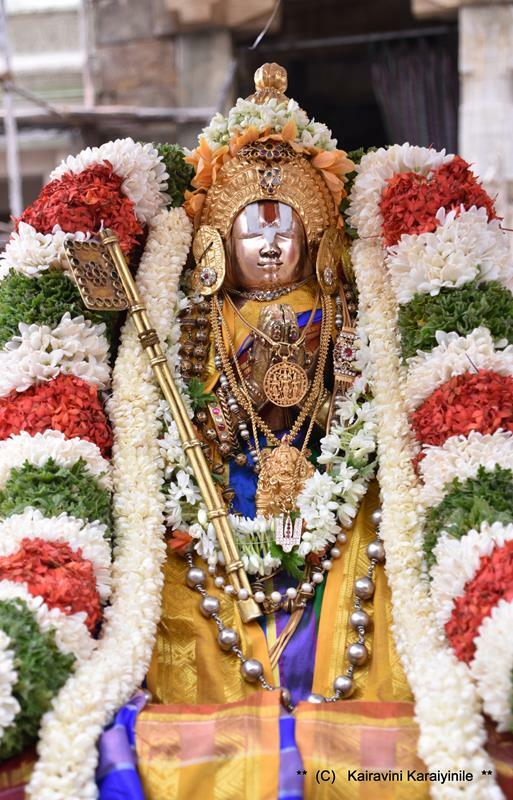 Year or so later, he travelled to Delhi pursuing the mangala vigraha of Chelva Pillai who crept towards Yathiraja, when he affectionately called varai .. the decad in Thiruvaimozhi ~ ‘Oru nayakamai’ was offered by Acarya to Thirunaranan on punarvasu festival. Of the instructions given by Swami Ramanujar to his disciples – is – ‘to construct at least a hut in the foothills of Yadusaila and stay there for a while’. 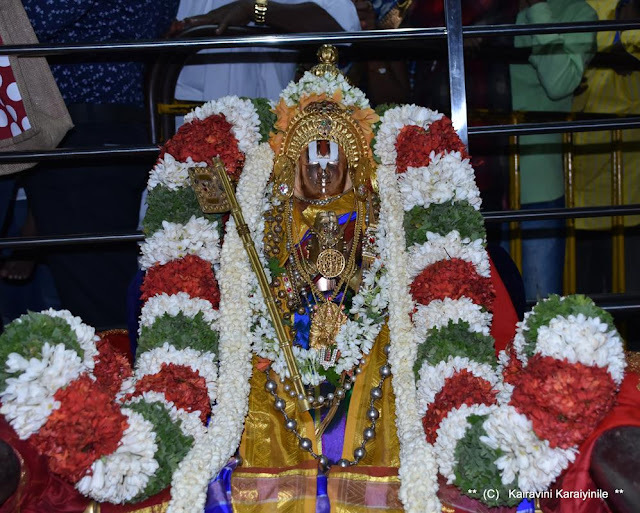 சரித்திரம் பலப்பல சாம்ராஜ்யங்களையும், நதிகளின் தீரத்திலே நாகரகங்களையும் கண்டுள்ளது. நம் போன்ற ஸ்ரீவைணவர்களுக்கு பல்வேறு க்ஷேத்திரங்களுக்கு சென்று ஸ்ரீமன் நாராயணனை சேவித்து, கைங்கர்யங்கள் செய்து, அவன் புகழ் பாடி திளைப்பதே பேரின்பம். இதோ சுவாமி நம்மாழ்வார் நமக்கு அருளின நல்முத்து. 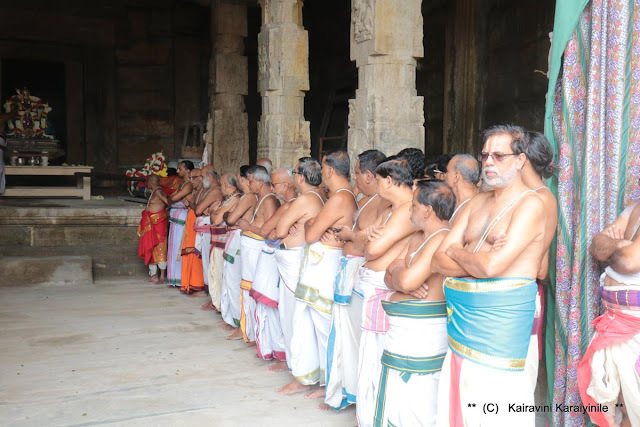 திருவாய்மொழி நான்காம் பத்து - முதல் திருவாய்மொழி. 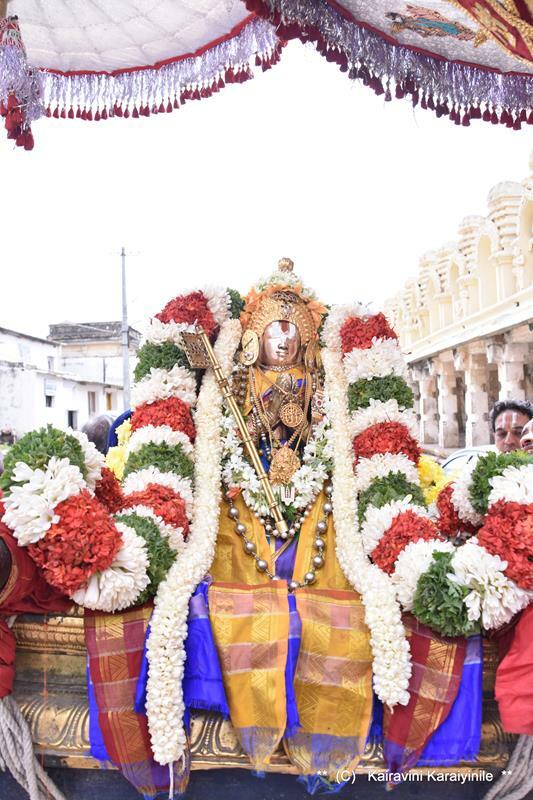 திருநாரணன்தாள் காலம் பெறச் சிந்தித்து உய்ம்மினோ.! அப்படியாயின் நாம் உய்யும் வகைதான் ஏதோ ? சுவாமி நம்மாழ்வார் நமக்கு காட்டுவது : 'திருநாரணன்தாள் காலம்பெறச் சிந்தித்துய்ம்மினோ' ~ அற்புதமான தலமான திருநாராயணபுரத்திலே எழுந்து அருளியிருக்கும், செல்வப்பிள்ளையான சம்பத்குமாரனை தொழுது நலன் பெறுவீர் என்பதாக - இத்திருவாய்மொழியைத் திருநாராயணபுரத்துத் திருநாராயணப் பெருமாளுக்கு நம் ஆசார்யர் உடையவர் ஸமர்ப்பித்ததாக ஸம்ப்ரதாயம்வல்ல பெரியோர் பகர்வர். In this World, there have been mighty Kings – not any who ruled the entire Universe but many lesser mortals with valour who ruled over a piece of land and were proud - but history has it that they have fallen biting the dust – that what can lesser humans who possess broken pots as their asset dream of …. 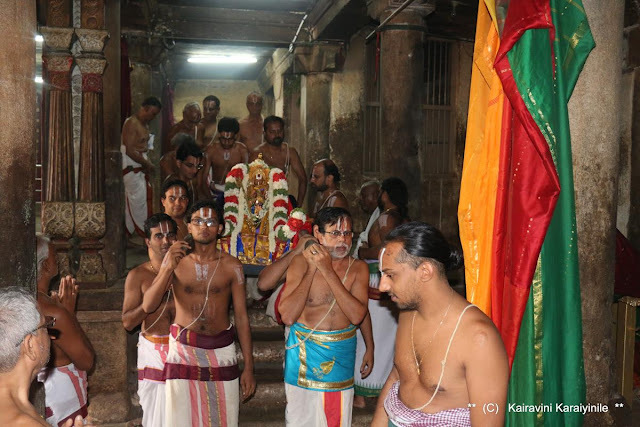 Alwar directs us to fall at the feet of Lord Sriman Narayana – Swami Emperumanar ascribed this song to Thirunaranar of Thirunarayanapuram. Our Acarya’s teachings were directed towards ‘prapatti’ (complete surrender unto Him) in total abandonment of ego. 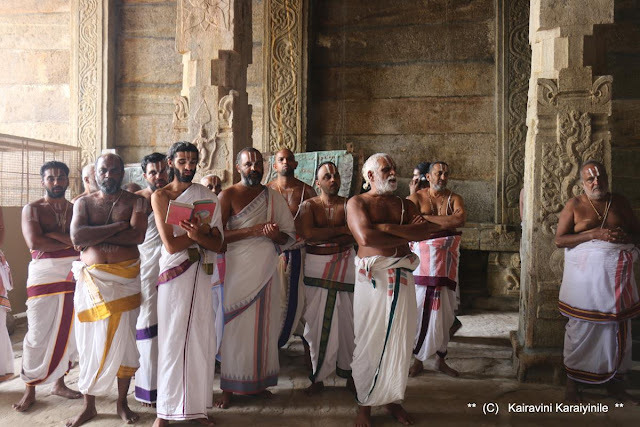 He instituted glorious practices in management of Temple which stand a testimony to his clear thinking and pro-active planning. 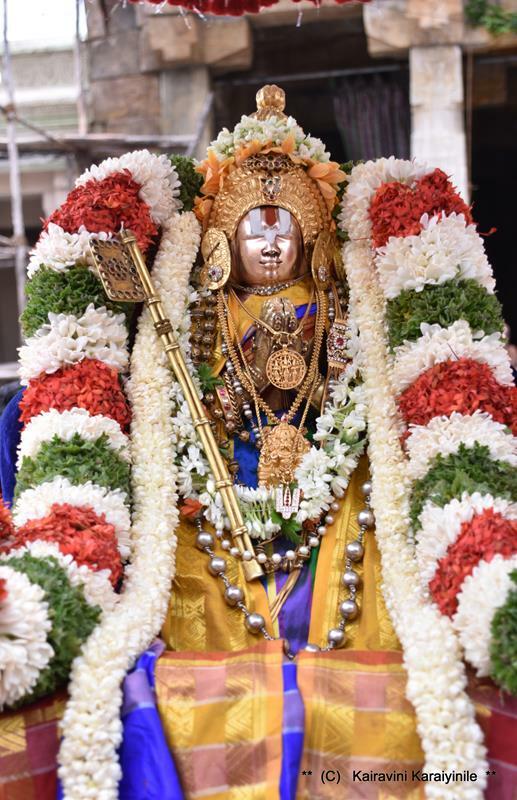 It was our fortune that we had darshan of the most beautiful Sri Ramanujar at Melukote on 4th Aug 2018. 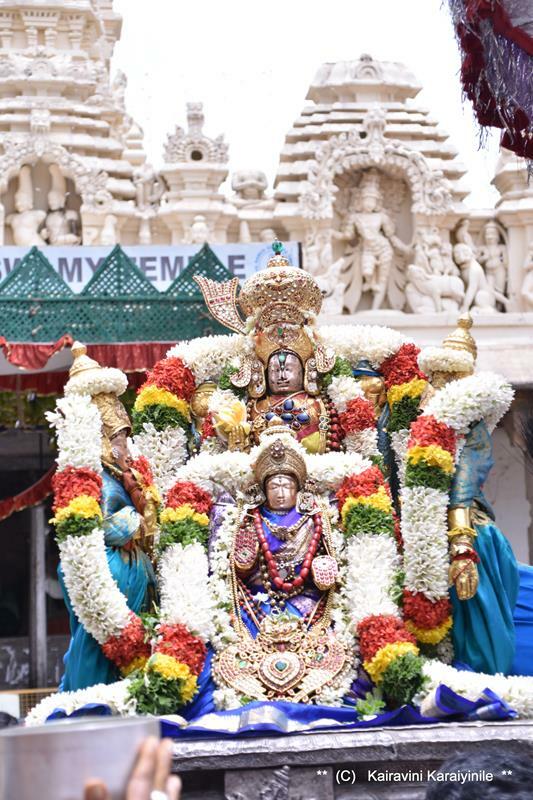 It was ‘Sri Krishna Raja mudi uthsavam’ whence Sri Chellapillai with Ubaya nachimars on His side and Sri Yadugirivalli thayar seated at His feet had purappadu. 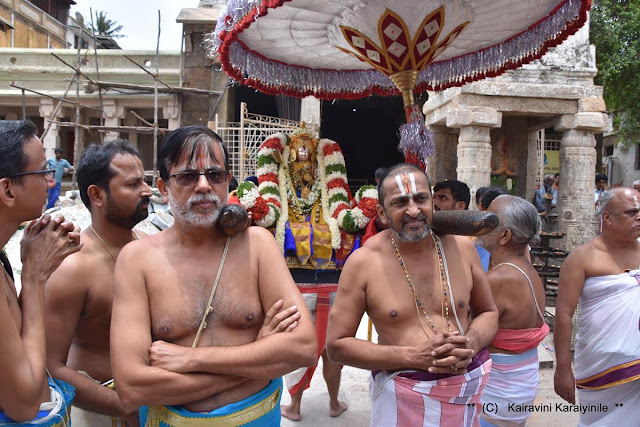 Sri Ramanujar too accompanied them. 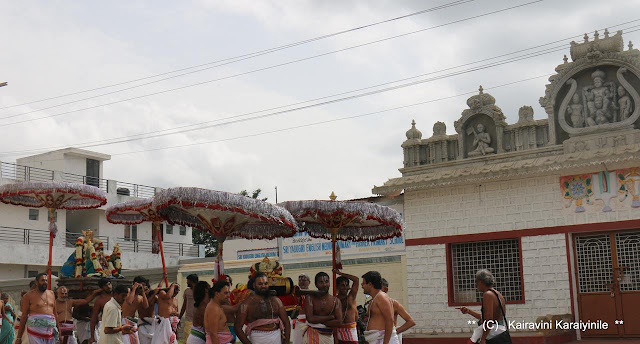 Here are some photos taken during that grand purappadu at Thirunarayanapuram in the afternoon. The most striking quality of our greatest Acaryar Udayavar was his intense humanism, compassion, charity and utter contempt for caste superiority. 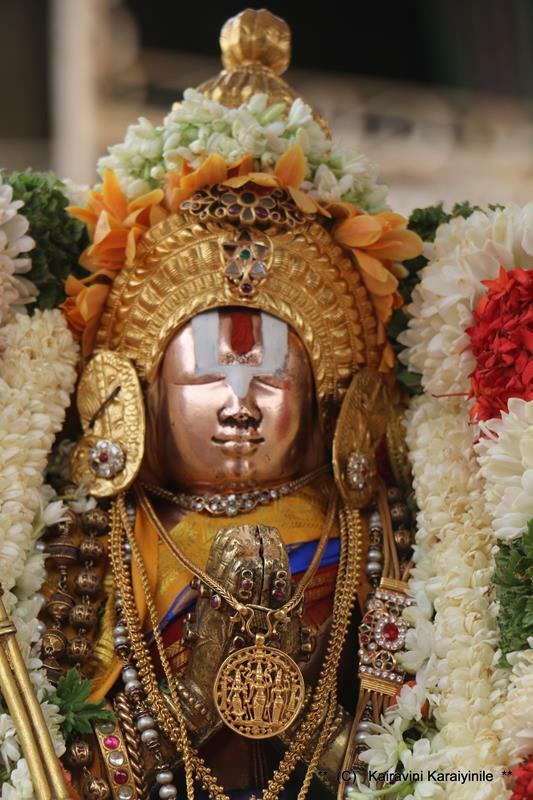 The true ornaments of any Sri Vaishnava according to Sri Ramanujar are the qualities of mercy and kindness. Biblio : hearty thanks to book ‘Melukote through the ages’ ~ published by Academy of Sanskrit research. Very interesting! Wouldn't have gotten to know all this but for this post! Thanks for sharing!